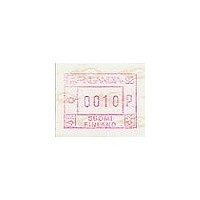 Frama (04.01.1988) - Philatelic Exhibition FINLANDIA 88 (2). Mint ATM small value. Frama (04.01.1988) - Philatelic Exhibition FINLANDIA 88 (2). 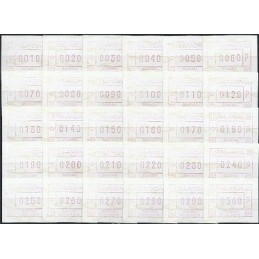 Collection of 30 mint ATMs, face values comprised between 0010 P and 0300 P, in steps of 10 P.
FINLAND (1988). FINLANDIA 88 (2). Set 3 val. Frama (04.01.1988) - Philatelic Exhibition FINLANDIA 88 (2). Mint set 3 values (0140 - 0180 - 0240 P). Frama (04.01.1988) - Philatelic Exhibition FINLANDIA 88 (2). Set 3 values (0140 - 0180 - 0240 P), with first day postmark.